For everyone at Primrose Lane, our first priority is to care for every child in a secure, friendly environment enabling them to skip into school and leap into learning! As part for our caring role, we support children's emotional and social learning throughout their time at school. We do this during lesson times, break times and through activities such as PE and sport and assemblies. We also use the Thrive Approach across the school. Children do not always recognise and cannot always put their needs into words, but the way children behave can tell us a lot about how they are feeling. In the old days children who were finding life hard were sometimes given harmful labels, like 'naughty' or 'very shy'. The Thrive Approach draws on the latest research – from current neuroscience, current studies of effective learning, current models of child development and recent attachment research – in order to help the school to understand the needs being signalled by children's behaviour. It gives us targeted strategies and activities to help them with learning and life. Central to the approach is a computer programme that helps us to identify any ‘interruption’ in a child’s emotional and social development. It gives us clear, simple strategies to use with the child to support their emotional learning. If these strategies are used repeatedly at home and at school, they will accelerate brain development and help the child with relationships and their learning. Why do we need Thrive? Unfortunately, like all of us at some point in our lives, children may face challenges that knock them off course. What is needed then is understanding and support. Many children will respond to the care, understanding and support given by parents, family, friends and teachers. However, some children need a little bit extra. What extra support can Primrose Lane offer? Children who need a little bit of extra help are identified through our whole-class screening process, by class teachers and Thrive practitioners, or through communication with families or outside agencies. For some children there may be an obvious reason why they need a bit of extra support. This might be bereavement, family break down or an identified medical condition such as ADHD. For others, there can be no obvious trigger to why they are finding some aspects of school and/or home life difficult or challenging. Class teachers, our qualified practitioners, Mrs Winstanley our Inclusion Manager and Mrs Orme our Learning Mentor, carry out full assessments on the whole class to identify children's social, emotional and behavioural needs. This helps us to build a bespoke Thrive Action Plan of activities to support their needs. What is a Thrive Action Plan? A Thrive Action Plan is a plan of activities tailored to support a child's identified social and emotional learning targets. The activities are one-to-one and small group relational, play and arts-based activities designed to help the child feel better about himself; become more resilient and resourceful; form trusting, rewarding relationships; be compassionate and empathetic; and/or be able to overcome difficulties, challenges and setbacks. They might include playing in the sand, cooking, painting, model making, exploring difficult situations through role-play or comic strips, playing strategy games or projects focusing on the child's own interests. Action Plans are shared with parents on request and they are encouraged to do some of the activities at home if possible. They are reviewed regularly to see the progress children have made. 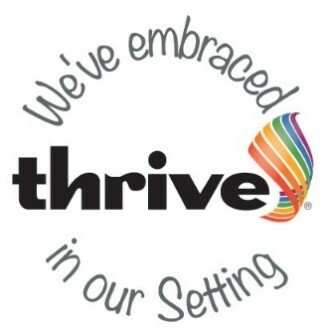 We have created an inviting, safe, relaxing environment in our Thrive room and many pupils have benefited from and continue to benefit from the Thrive approach with positive and successful outcomes. Many of the activities in the Thrive Room are often simple repetitive activities completed over time, within a safe and caring environment. It is from this repetition and positive approach that pathways in the brain are developed leading to a child enjoying life and learning. The Thrive Room is not a short term fix to life’s ups and downs, but more a long term investment in preparing our children for the future. Many of our activities are developed using as many of our senses as possible as we now know that areas of the brain are accessed through these activities. The relationship the child builds with adults is now proven to be fundamental to the child’s emotional confidence. As the child’s emotional literacy grows those challenges faced through life with friendships and school life can be addressed. Staff are then available to support the children at managing the feelings and challenges as they meet them. For many children across the school, Thrive time is considered a real treat! Who wouldn't want to spend half an hour a week in a small group or with the one-to-one attention of a caring adult doing play activities? However, we try to emphasis to everyone that Thrive is just like any other learning intervention. If children struggle with reading, we give them extra support, and it's the same with social and emotional learning, if they are struggling or are challenged, they get extra support. Everyone gets class Thrive activities (although they might not realise it); most art, PE or PSHE activities are taught within the Thrive Approach. But if your child needs regular out of class Thrive time, one-to-one or in a small group, parents are consulted and asked for their input into their child’s social and emotional wellbeing. What makes Primrose Lane a Thrive school? At Primrose Lane we don't consider Thrive to be an intervention for just a few children done in the Thrive Room, we consider it to be a whole-school approach. We believe that all behaviour is communication and that it needs to be understood and supported - not "dealt" with. Thrive feeds into everything we do; celebration assemblies, getting to know everyone and their families, sharing all achievements not just academic ones, celebrating all the families that make-up our school community and our collective spirit. If you want to know more about Thrive, do visit the Thrive Approach website www.thethriveapproach.co.uk or speak to Mrs Winstanley or Mrs Orme.